The Raspberry Pi ® can be used as a very effective home automation system when used with Stefan Stromberg's OpenNetHome automation software, as discussed in the previous article. This system does not require an external Internet connection to operate, so this is a good choice if you have security concerns. You can access it remotely with an Internet connection, but that functionality is optional. 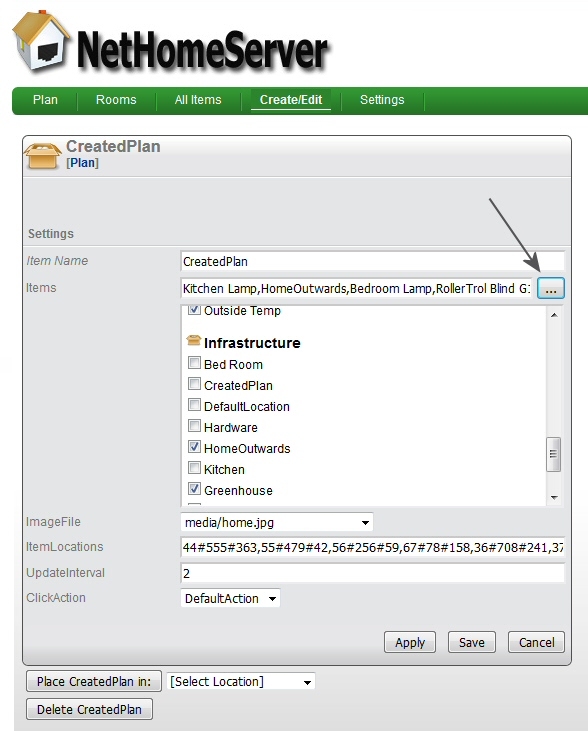 This article will discuss the process of creating floor plans to show the placement of devices such as our shade and blind motors, window and skylight openers, and other items. We are using Emmanuel Puybaret's excellent Sweet Home 3D CAD program. The picture below was generated by this program, but you could use any jpeg or png image. As mentioned previously, you can also have multiple plan views if you want to focus in detail on a particular area or room in your floorplan view. We are using it for greenhouse control in our test system for our greenhouse division, so we definitely want to show the greenhouse separately from the house. The above picture is an actual screen capture from a Windows® laptop, while the home automation software is running on the Raspberry Pi. Note that the OpenNetHome system has the ability to display the state of the blind, whether it is fully opened or closed, or part way (Down 5% in picture). Also note the link to the greenhouse plan in the upper left hand corner; when you click or press the link, the greenhouse plan is displayed. In this way you can create lots of different plans and link to them from any plan view. Each plan has its own URL, so you can also create a bookmark to it. The Sweet Home 3D program is very easy to use and you can very quickly create a basic plan and save it as an image file. We won't cover that process here, but there is an extensive help system associated with the program that makes quick work of it. We found it so easy that we did not have to bother with the help files, although we have had a lot of 3D CAD experience. 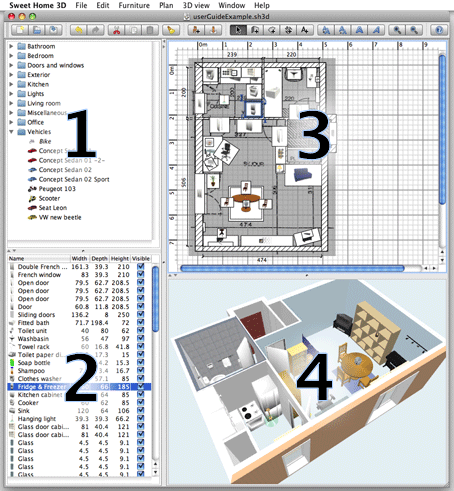 But even a newbie will find this program very easy to quickly create a basic 3D floor plan. Once the new layout image has been created, you should save it to the 'media' folder on the Raspberry Pi where the OpenNetHome program is installed. Go Create/Edit => Plan (classed as infrastructure). This will create a new plan entity for your new image. In the dialog box that appears, give it a name (we used Greenhouse), then select the image file you created from the drop-down list. Leave everything else in that dialog as is for now, you can update it later. Go All Items => Infrastructure => CreatedPlan (this is the default primary plan name that comes with the program). When the dialog box for the primary plan appears, click or press the dotted button at the end of the Items line (see arrow at right). This will cause the checklist selection system to appear. Scroll down through the checklist until you get to the Infrastructure section, then put a checkmark in front of the name of your new image file that you created. Save and close the dialog. When you load the primary plan from the main menu, you should now see the link to the new plan you created. With the primary plan open, you can click/press Edit this page and drag the link wherever you want it. You can create and link them all on any floorplan page, and you can also create bookmarks in your browser for each plan view. 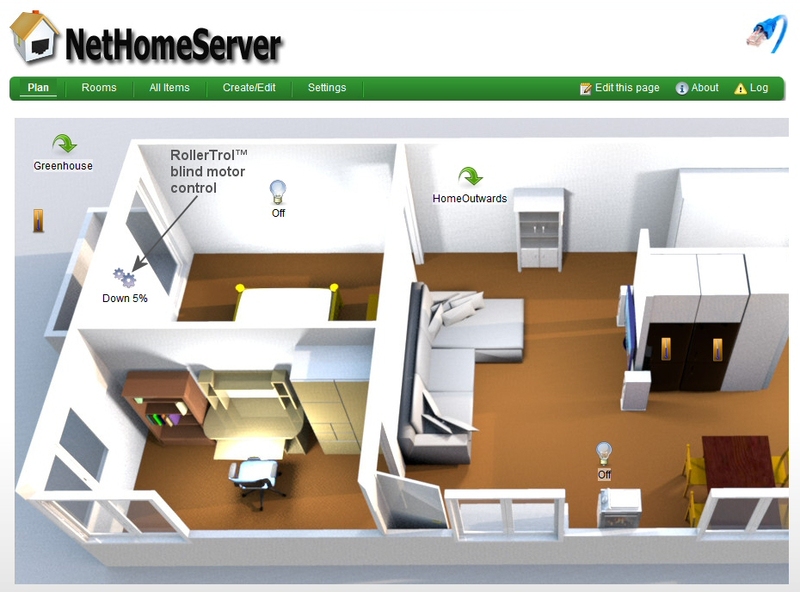 This is a powerful system that can be expanded over time as you expand your home automation system.